It has become a universally known fact that sugar gives us bad rap. From tooth decay to messy insulin levels, there really isn’t one fine reason why we shouldn’t ditch the old habit and look for solutions elsewhere. However, one should be careful about where exactly that elsewhere might take us. If it leads to artificial sugar substitutes that might not be linked to obesity, but have proven themselves to be the new sweet poison, then a smart person might start considering to go on living without any kind of sweetener altogether. Luckily, we don’t have to reach that phase of renunciation, primarily because there are natural ways to keep the sweetness coming, without contributing to the rise of a fat, toothless, intoxicated version of ourselves on a daily basis. Originating form South Africa, this plant based, natural sugar substitute will turn your world around with its sweet benefits and none of the trouble. No extra calories included, no sudden and dangerous rise of blood levels are the perks that come along with the delightful natural taste, 200 to 300 times sweeter that the white invader. You can freely use it for baking or sprinkling cookies, just make sure that you use a very small fraction of what you’d usually put if it were sugar. If you are already planning your switch to a healthier lifestyle, buy stevia packs so that you can begin your steady flow of non-damaging sweetness in the best way possible. A natural sweetener that is derived from the agave plant and is sweeter than sugar. You can simply use less of it while knowing that it also has a great benefit for you – it has the characteristics of a pro-biotic which means that your intestinal bacteria will be put in order while you’re simply taking pleasure in your desert. It almost tastes like caramel, therefore we shouldn’t even discuss whether you’ll love it or not. It dissolves in liquids without a trace, so you can have it with your coffee or tea every day. A good tip to remember when cooking with this natural sugar substitute is to carefully consider ¾ cup of agave syrup as 1 cup of sugar. This natural sweetener is indeed a nutrient bomb, including magnesium, calcium and vitamin B6 as innate elements of its content. It has also been proven that the blackstrap molasses reveals great antioxidant features. Some women use it more when they want to relieve their premenstrual pain. When you are face to face with shelves in the supermarket, deciding whether to buy stevia packs, agave nectar, blackstrap molasses sweetener or all three, you’ll also notice a name that does not ring a bell of some exotic plant, but it doesn’t make it less of a natural source of sweetness. This is in fact a natural carbohydrate that is found in vegetables and fibrous fruit. For commercial purposes, it is being extracted from corn cobs or birch tree barks. 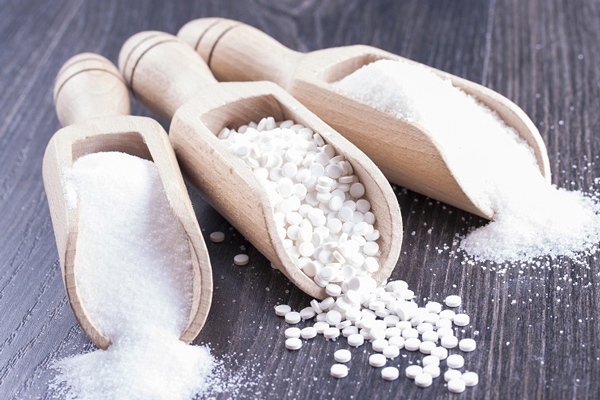 Whichever natural sweetener ends up being your choice, what you should know that the moment you stop being addicted to white sugar and it’s set ’em up and knock ’em down routine, you’ll feel a more steady and normal flow of energy and might even start melting some of those unwanted calories.